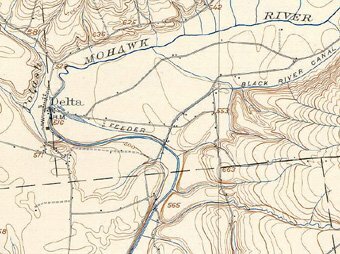 Governor DeWitt Clinton proposes construction of a Black River Canal to link the Mohawk River with Lake Ontario. First Canal Survey. Engineer James Geddes reports on three routes from Herkimer, Boonville and Fort Bull -- all terminating at Ogdensburg on the St. Lawrence. First Black River Canal Company formed to build a canal from Rome to Lyons Falls and improve the river from Lyons Falls to Carthage within 3 years. Authorized to sell $400,000 in stock. Second Canal Survey. Alfred Cruger completes survey for Black River Company. Proposes 34-mile canal, 11-mile feeder, 40 miles of river navigation, and 1,090 feet of lockage. State Legislature orders Canal Commissioners to make survey. Fail to do so. Commissioners again ordered to make survey. Third Canal Survey. Holmes Hutchinson reports on canal with feeder, inclined planes, and locks. Black River Canal Company fails to raise sufficient capital. 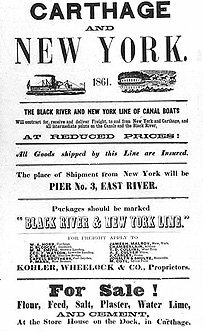 Second Black River Company incorporated to build canal or railroad. Authorized to sell $900,000 in stock. Fourth Canal Survey. 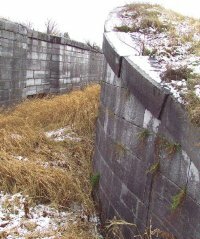 T. B. Jervis reports on a canal 26 ft. wide, 4 ft. deep, with banks 7 ft. high, with or without inclined planes. Citizens of Oneida, Lewis, Jefferson, & St. Lawrence countries draw up memorial in favor of a canal. State Canal Commission authorizes construction of an overland Black River Canal and Erie Canal feeder, as well as improvement of Black River. Porteous R. Root appointed chief engineer. Root completes detailed location surveys. First 14 miles located and put under contract. Contracts let for construction from Lansing Kill to Lyons Falls, and for 10-mile feeder canal from Forestport to Boonville. E. H. Broadhead reports on extending canal from Carthage to Lake Ontario. Deficits in general revenue prompt state legislature to pass “Stop and Tax Law,” halting all work on the canal except necessary repairs. Forestport feeder canal provides 11,500 cu. ft. per minute to Erie Canal. State Canal Commissioners order canal materials to be sold with proceeds used to preserve existing work. State Constitution forbids selling, leasing, or disposing of canal. “Stop and Tax Law” lifted. Contracts let to complete locks near headwaters at Boonville. Erie Canal Feeder Canal opens between Forestport and Boonville (10 miles). 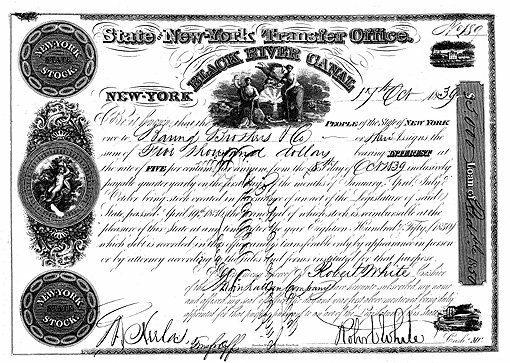 Black River Steam Boat Company chartered. Water for Erie Canal begins to flow. Canal filled between Boonville and Rome. Survey of Woodhull Lake and Wolf Lake completed. Temporary dam built. State Legislature approves funds for improving river between Lyons Falls and Boonville. May 10. Southern section of canal opens (25 miles) between Rome and Boonville. Contracts let for northern section from Port Leyden to Lyons Falls. November 1. Canal from Boonville to Port Leyden opens (6 miles). Plans made for four reservoirs (2 billion cu. ft. water) and for improving Black River between Lyons Falls and Carthage. Contracts let for Mohawk feeder canal at Delta. Bridge planned over Black River at Carthage. Contracts let for Woodhull and North Lake reservoirs. 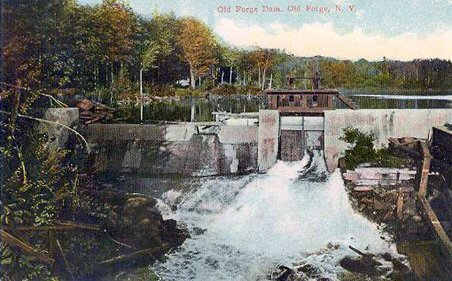 Dams built at Carthage and Lyons Falls. Locks 108 and 109 completed. November 13. Canal between Port Leyden and Lyons Falls opens (3 miles). Contracts let for reservoirs at South Lake and Chub Lake. North Branch reservoir completed (423 acres, 310 million cu. ft. capacity). Woodhull and South Lake reservoirs put under contract. Guard-lock for Delta feeder completed. Contracts let for Otter Creek lock and dam. October 10. Contracts let for improving the Black River between Lyons Falls and Carthage (60 ft. channel, 5 ft. water). Contract let for dam at Carthage. Woodhull Reservoir completed (1,236 acres, 780,943,680 cu. ft. capacity). South Lake Reservoir completed (518 acres). Otter Creek lock and dam completed. River navigation opens between Carthage and Beach’s Bridge, Lowville (22.5 miles). Canal commissioners urge completion of Chub Lake Reservoir. Lock and dam authorized between Otter Creek and Carthage. (Completed 1869). and at North St. in Port Leyden. Work contracted for lock and dam at Otter Creek (3 miles above Beach’s Bridge). State takes control of bridges at Illingsworth and Beach’s Landing (Lowville). Bridge authorized over canal at Main St. in Port Leyden. (Completed 1869). Bridge authorized over Beaver River. Iron bridge to be built at Floyd St. in Rome. April 21. Dam break at North Lake Reservoir floods Black River Valley as far as Watertown. Claims for $700,000 filed. First level of Black River Canal at Rome enlarged to the size of Erie. Dam to be built at Moose River at Old Forge (outlet of Fulton Chain of Lakes). Sand Lake Reservoir completed (200 million cu. ft. capacity). February 1. State canal system consolidated into three administrative divisions. Black River Canal placed in Middle Division. Canal board ordered to examine and report on the possible sale of canal. January 13. Canal Commissioner Thayer and State Engineer Sweet decide against abandoning or selling canal. Canal Commission reports that the canal should be kept open and maintained intact. All locks on the Black River Canal repaired. Surveys of Canachagala, Twin, and White lakes undertaken. Dam built at Second Bisby Lake. Reservoirs to be built on Independence and Beaver rivers. Canachagala, Bisby, White, Twin, and Fulton Chain Lake reservoirs completed. State Constitution (Art. VII, Sec. 6) prohibits lease or sale of canal. Stillwater selected as reservoir site on Beaver River. Iron canal bridge across Chenango Canal at Utica removed and placed across Black River Canal at Rome. June 8. Wooden spillway at Lyons Falls washes out. Work begins on second Forestport Reservoir. (Completed December, 1893). Towpath to be built on south bank of Beaver River in town of New Bremen. Work begins on Stillwater Dam. Stillwater Dam completed (9.5 ft. above low water, 150 ft. spillway; 328 million cu. ft. capacity). January 5. South abutment and 90 ft. of the dam and apron at the head of Delta Feeder washes out. Locks 8 and 48 rebuilt. Beaver River Dam at Stillwater enlarged and raised 5 feet. (Completed 1894). Forestport Reservoir damages New York Central Railroad embankment. Work begins on bridge over canal between Carthage and West Carthage. (Completed 1896). Work begins on draw-bridge over canal at Garden St. in Rome. (Completed 1896). Work begins on iron bridge over canal at Thomas St. in Rome. (Completed 1896). Locks 18, 28, and 37 rebuilt. Locks 39, 40, and 41 rebuilt. July 23. First Forestport Break (400 ft., 50 ft. deep). Locks 49 and 96 rebuilt. David E. Whitford reports on water-supply from Adirondack forest. May 23. Second Forestport Break. Locks 51 and 55 rebuilt. State Superintendent of Public Works, Colonel John Partridge, hires Pinkerton Detective Agency to investigate the second Forestport break. September 18. Third Forestport Break. Superintendent Partridge recommends abandoning canal between Boonville and Lyons Falls. Perpetrators of Forestport Breaks apprehended, indicted, and convicted. Work begins on replacing the lower Forestport Dam with concrete structure. (Completed 1903). July 28. Break near Lock 13. Concrete dam on Beaver River completed. Bridges 4, 11 and 9 replaced. Governor Frank Higgins recommends abandoning Black River Canal between Boonville and Rome. Work begins on Delta Dam on Mohawk north of Rome. Governor John Dix vetoes bill to extend canal from Carthage to Sackett’s Harbor on Lake Ontario. Governor Martin Glynn vetoes canal extension. Noble Whitford's History of the Canal System of New York.